Obviously, Tiger’s come-from-behind win at the 2019 Masters Championship was an epic redemption and rise-from-the-ashes story. But is there a marketing lesson we can also learn from this? 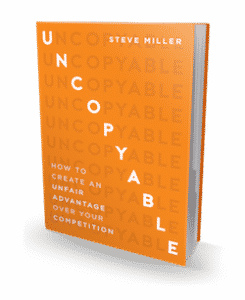 Watch this week’s UNCOPYABLE Business episode and find out! Welcome all the way back, Tiger! Thanks Steve – outstanding insight and context connecting Tiger’s epic win and come back to marketing. I will use your transformation vs. transaction in my work with medical flight programs throughout the USA. You are so right about transformation and that Tiger is the greatest of all times. And that’s coming from a 28 + handicapper and damn proud of it! I play – I play often – I practice like a maniac (even though I stay at 100 – 105) I have the grand joy of golf in my life. Thanks Steve I will share this video. Thanks, Rich! Glad you can use this with medical flight programs. 28 handicap? A good pro should be able to knock 10 strokes off pretty easy! Here’s a piece of advice I gave a golf pal last year who was an 18. Stop aiming at pins. Just aim ALL approach shots at the center of the green. Hitting greens will cut your score faster than almost anything else. He was a 10 in less than a year.